As I reported previously, on Wednesday Indonesia sank a Chinese vessel caught fishing illegally in Indonesian waters near the South China Sea, the first such instance since President Joko “Jokowi” Widodo declared war on illegal fishing (See: “Indonesia Sinks First Vessel From China Under Jokowi”). The boat was among 41 vessels simultaneously destroyed to commemorate National Awakening Day, with the others being from neighboring states including the Philippines, Thailand, and Vietnam. But why did the Jokowi government choose to sink its first Chinese vessel now? A standard reply from government officials would be that the sinking of the Chinese vessel, just like the sinking of any other vessel, was scheduled in line with legal proceedings. That is, the timing of the sinking of the empty Chinese vessel was dependent on when other legal issues were resolved via court proceedings and when the proper authorization was obtained. It is certainly true that the legal aspect of this is significant. Close observers know there has been an ongoing debate about the extent to which Indonesian practices are conform with international law, particularly the United Nations Convention on the Law of the Sea (UNCLOS) (See: “Explaining Indonesia’s ‘Sink The Vessels Policy’ Under Jokowi”). Thus far, Jakarta has displayed regard for the law even while carrying out its controversial policy. But it is also true that the legal argument leaves much left to be desired. First, it accounts neither for the clear differences in the way that these sinkings have been carried out nor Indonesia’s greater caution in dealing with China on this question relative to other countries. While Indonesia has sunk boats from Malaysia, Papua New Guinea, the Philippines, Thailand, and Vietnam over the past few months, it held off on sinking ships from China until this week, despite seizing them and claiming that it would not be afraid to do so. (See: “Indonesia May Sink Chinese Vessels: Jokowi Adviser”). And as I noted in my previous piece, even when it did sink a Chinese vessel, the way it did so — by placing it among 41 vessels in line with a particular national occasion, rather than sinking the Chinese ship alone or in a smaller group — suggested that Jakarta was more cognizant about backlash in this case than it has been in others. By choosing to finally sink a Chinese vessel now, Jakarta may be signaling not only its willingness to apply its ‘sink the vessels’ policy consistently, but perhaps its desire to take a harder line on illegal fishing more generally as well — albeit within limits. 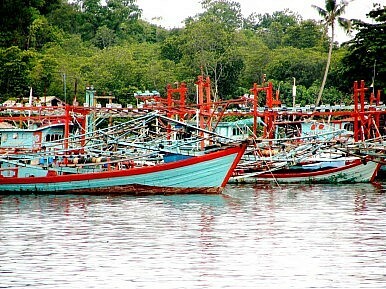 It was notable, for instance, that Indonesia’s Maritime Affairs and Fisheries Minister Susi Pudjiastuti told The Jakarta Post following the sinking that the government had been too lenient in dealing with illegal fishing. She also said that Jakarta was considering sinking vessels ‘on the spot’ — with just a permit from the court instead of the full judicial process. Second, it is far from clear whether the legal argument fully accounts for why this particular vessel was selected to be sunk at this time. According to The Jakarta Post, the vessel that was sunk — the Gui Xie Yu 12661 — was seized almost six years ago on June 20, 2009 for fishing in Indonesia’s exclusive economic zone (EEZ) in the South China Sea. That suggests that it was embroiled in a flashpoint in Sino-Indonesian relations during that time, where eight boats containing 75 Chinese fishermen were seized for infringing on Jakarta’s EEZ. While an agreement was eventually worked out between the two countries, it is interesting that this was the first Chinese vessel to be sunk years later under the Jokowi administration. Given this government’s prickliness on sovereignty questions, along with rising concerns about China’s nine-dash line claim in the South China Sea, observers can’t be blamed for suspecting that something more than just coincidence may be at play (See for instance: “Natuna Is Indonesian, Not Chinese: Jokowi Adviser”).